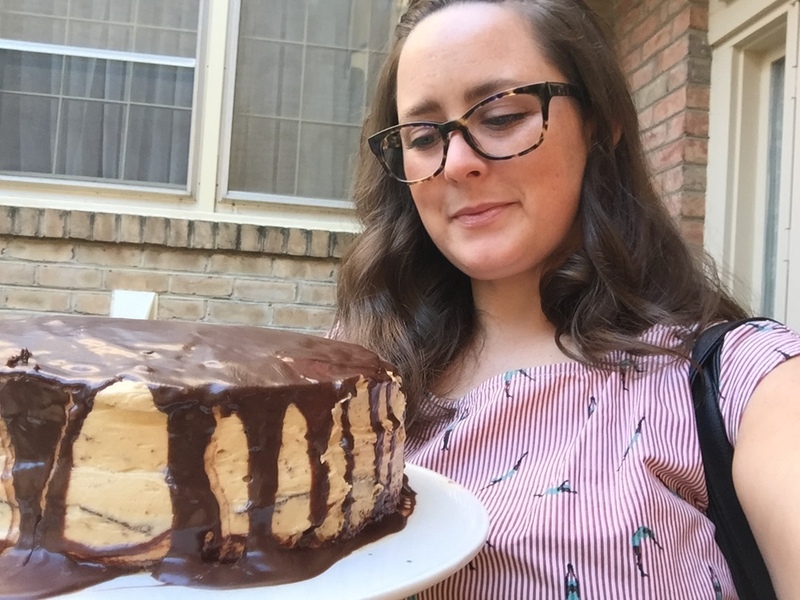 ME DESPERATELY TRYING TO PHOTOGRAPH MYSELF WITH THE CAKE, WITH ONE ARM. CAKES ARE HEAVY. While in Alaska I picked up a recipe book for Alaska sourdough. YOU GUYS, I WENT TO ALASKA! This thin little book gave a brief history on how the frontiersman and prospectors, who came up from California to Alaska alive. The sourdough, which at it's basest form is just flour and water BASICALLY kept them alive. Sourdough for the win! 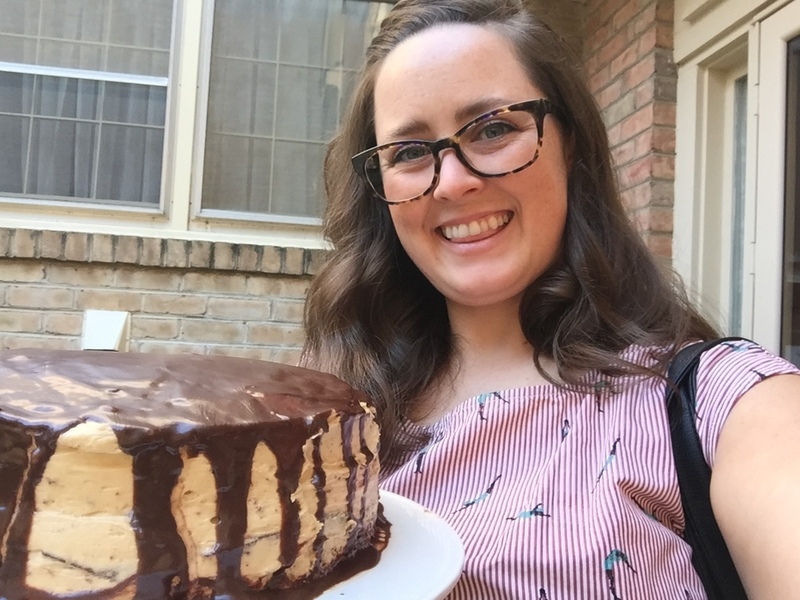 But we're not here to talk about simple sourdough in this post, no, no, we're here to talk about cake! The recipe is simple but the result was a delciously moist cake, it may dry out quickly after being cut, but how long does cake last in your house?? Before beginning, be sure starter, milk and eggs are at room temperature. Cream butter and sugar until light and fluffy. Beat in eggs and melted chocolate. Add sourdough starter, milk and vanilla- mix well. Sift together flour, baking soda and salt and fold until smooth. This week I made dinner not once, but twice. Big meal cooking for me happens usually on Sunday night and maybe once during the week. Maybe. Usually a weeknight dinner is a sandwich, leftovers, frozen mini-pizza or eggs and toast. Breakfast is always a good option for dinner. Trying a new recipe this week, olive oil braised chickpeas. This recipe has everything I love- lemon, olives, chickpeas, cheese AND serve it with bread? Say no more! I did make an alteration and add chopped fresh tomatoes to mine. If you like greek food, savory, salty flavors this is for you. 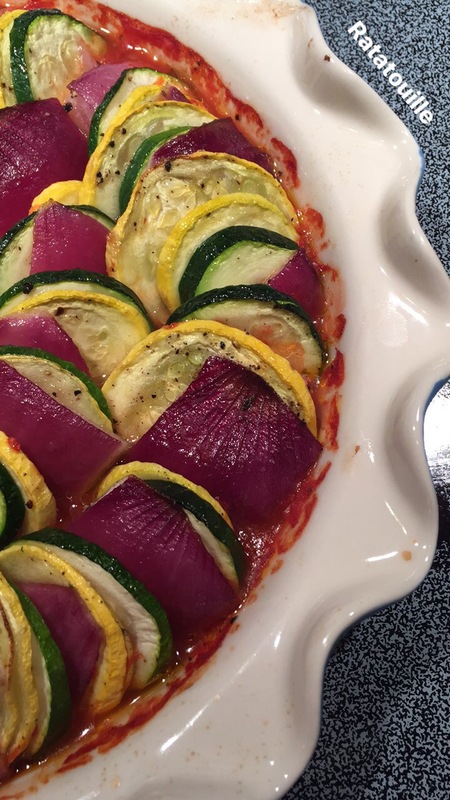 Making more of an effort this year to eat veggies this week I made ratatouille. Tomato sauce on the bottom and slices of squash and onion on the top. Served with some brown rice makes a health dinner and leftovers for a few more meals. I don't follow a recipe for this dish, so I'm not wholly sure it's authentic. But I know how to do this by heart and it's dang tastey. Bake at 400˚ for 30-40 mins until sauce bubbles and veggies are softened and cooked. Last June I was fortunate to go to Alaska as a part of a work trip. Yes, June and yes this post is going up in January the following year. Alaska is far away and very big. both of those thing syou might be thinking, well, duh Amy, but really- it's far and it's big, but you should go all the same. The scenic views are everywhere. Even from the middle of downtown Anchorage the mountains in the distance are breathtaking. After our official visit was complete, it wa time to explore the surrounding area. This trip ran the gambit of small, quaint towns, mountains, glaciers, water, and general town fun. The visit to Alyeska resort just south of Anchorage quickly ticked all the basic Alaska boxes. Snow, mountains, and an inlet of sea water. This ski resort is still beautiful in the summer, if a little eerie. Taking the tram up to the of the mountain and eating lunch at the cafe gave great views and good food. We left for Talkeetna, a town famous for being tiny and cute. We stayed at the Talkeetna Roadhouse, a historic roadhouse with a few rooms but a big dining room and a hearty kitchen. This old school hostel is surrounded by restaurants, shops and a little sketchy looking general store. You can walk the length of the town in about 15 minutes. We arrived late in the day, which turned out to be fortunate because all the visitors had left and only those staying in the town were around. Often times cruise ships and tours will drop off loads of people to visit this tiny town, which instantly becomes overrun with tourist. A little walk off of the main street brought you to the Susitna river and on this clear evening, a view of the Alaska range and Denali. Denali National Park was high on my list to visit when planning this Alaska trip. With a little more research I realized that Denali is not a park that you can casually visit for a day, but you have to dedicate days to, days that I did not have. A short hike and looped bus ride later, we headed back south. LET'S TALK ABOUT LIGHT. There's A LOT of it during an Alaskan Summer. For reference the photo on the left, as time stamped, was taken at 8:25 pm; and the photo on the right was around 11 pm. The endless daylight is NO JOKE. When I travel I always have an sleep mask and melatonin to help me adjust to a hotel bed or new timezone. Such fun! Thank goodness for that, because it was never needed more than in Alaska. Glaciers are cool, freezing some might say, things that you don't see every day. The glacier cruise out of Whittier was a great end of the trip. Alaska was fun, wildly different from the mainland of America and yet seemingly familiar. I'd like to go back someday but if now, this trip will remain a favorite adventure of mine. During the trip recorded the adventures via Snapchat. Below are links to watch the Snap stories from Alaska! Enjoy! Have I mentioned how much I love sourdough pancakes? The batter is malleable to whatever is your whim. If you're unfamiliar with my love of sourdough pancakes, here's this post for reference. For something more savory and substantial I made these pancakes for dinner. Whipping up a half batch of batter was just right for about 8 medium-ish pancakes. Perfect full meal for two people or entree for three or four. Using a large spoon, or pouring the batter into a measuring cup with a spout, pour the batter on to the pan. I topped my cakes with some hot sauce, but sour cream, hummus, tzatziki, you name it would be just as appetizing. With so many new babies in my life recently I've gotten pretty good at a go-to meal for the exhausted Mom's and Dad's- homemade frozen burritos. A gallon sized ziploc bag full of these guys in a bag with salsa, guac and chips is such an easy and complete meal/snack/munchies savior for late nights, early mornings and everything inbetween. I don't have a go-to recipe per say, which is what is great about burritos, whatever I have in the house become fair game. Leftover pulled pork? Pork burritos. Tons of veggies that need to used? Roasted veggies burritos. Went overboard on bacon? (C'mon we've all been there) Do breakfast burritos! Doing it a handful of times now I do have some advice. Get the HUGE tortillas. The massive ones you see in the store and think there's no way anyone needs a tortilla that size. Get those. Have everything ready, and roll them all at once. This might seem like a duh, but having ALL your fillings in bowls, with their own spoon in front of your workspace streamlines the whole building and rolling process. Use less filling than you think. Having everything laid out and using six different components to make you filling the volume can grow before you even realize it. Keep each item to the heaping spoon size- one of beans, one of cheese, one of rice, etc. Save wet fillings for eating. Don't waste space on salsa, guac or sour cream. They don't reheat well and can make your tortilla soggy. A soggy tortilla also doesn't reheat well. The website the Kitchn is a great resource as well. They have a few articles on making frozen burritos, How I Make Burritos to Freeze and Recipe: Freezer-Friendly Roasted Vegetable Burritos with Black Beans and Rice. I love breakfast. My love of this meal is right of their with Ron Swanson's. I'm not kidding. I also love sourdough, so sourdough pancakes is a natural fit. The first time I had these was when I visited my friend Leah in San Francisco. They were delish and served as breakfast and then a post birthday party late night snack. She gifted me some of her sourdough starter before I left for home. They're simple and require minimal amount of preparation. If you work at all with sourdough or baking you'll be familiar with the time and preparation required. Put the sourdough starter in a large bowl and add the milk, flour and sugar, then stir to combine. Cover the bowl and allow it to rest overnight at room temperature. When you are ready to cook, whisk the egg, melted butter and the vanilla extract together in a small bowl, then add the rested sponge. Add the salt and the baking soda to the batter and mix to combine. Pour some of the batter onto a preheated greased pan. Using a small ladle, or my preference a measuring cup, a to create pancakes on the pan, flipping them when they are well browned on the bottom. Serve immediately. Oh Seattle, you're just lovely. I think I like you very much. Last month I was fortunate to visit Seattle and Anchorage for work. (More on Anchorage later I mean, come on, Alaska deserves it's own post.) My work responsibilities began Monday, I flew out early to take advantage of the weekend with my colleague Dan. And I'm so glad we did, but this city needed much more time. Dan and I decided you can't go all the way to Seattle without driving down to Mount Rainier. Right?! The first day out in Seattle was a road trip down to Mount Rainier. Waking up early, checking out of our one night, fancy hotel, we picked up our car and hit the road south. A quick stop for coffee, windy roads and we were there. The mountain was shrouded in fog, but what we did see was wonderful. Arriving at the Visitor center we asked about what we could do on such a cloudy day. One thing was walking across the way and meandering through the lobby of the historic Paradise Inn. The vaulted rafters, and log made furniture makes you feel as though you've stepped back in time. Not prepared for any sort of actual hike, one simple stop for a breathtaking view was at Christine Falls (right). There are so many scenic pull offs while driving on the main road. There is loads to do in the park. Arriving back to town we checked into the hotel and quickly went off to explore. While we had a car we wanted to make the most of it. Setting off to Ballard, a neighborhood of Seattle about 20 minutes away from downtown. This fun and funky neighborhood was a great place to kill time. Dan had a plan for an epic bar crawl, with some keen insight from the doorman at the hotel, a quality, walkable, Seattle not-to-be-missed nightlife event. Unicorn Get the mermaid drink, it's a delicious take on a Dark and Stormy, also check out the B&W photo booth! Cha Cha Lounge Go down stairs, this is very important. (This was stressed over and over again by the doorman) Drink suggestion: the Jamison Arnold Palmers slushie. The Comet Tavern Don't be fooled by the crowd, there a bar in the back, just head straight there. Sam's Tavern If you're lucky, you too can crash someone's birthday party by going up to the loft, sneaking pieces of Domino's cookie cake and order drinks next to the leg lamp replica from a Christmas Story. The rest of our time was spent exploring the city, walking through the market, seeing some Seattle classics- the gum wall in Post Alley, the Space Needle and so much more! The city is pretty walkable and you can get to the main sights easily. You guys. I made something delicious. While, uh avoiding actual adult responsibilities on Saturday I made baked meringues for a Pavlova. I decided to make small meringues because full size Pavlova should be eaten within a few hours of being topped with cream and fruit. I will say though, I cheated. I have meringue powder I'd like to use up, so following the recipe on the back of the container to make my meringue. I've listed the Kitchn recipe below that I followed for everything else. I'm not sure if it's the meringue powder or my hurriedness but the centers of my meringues are white and kinda chewy when you bite into them. It's a little messy, but I would make it again. I'd can see it being a great alternative dessert for someone with gluten or dairy sensitivities. Swapping out the diary cream for coconut cream would be a quick and probably pretty tasty solution. 1. Prepare for Baking: Preheat the oven to 275°F with a rack in the lower third of the oven. Line a baking sheet with parchment. Trace a 9" circle on the parchment using a cake pan or dinner plate as a guide. (If making mini-pavlovas, use drinking glasses as guides.) Flip the parchment over. Mix the sugar and cornstarch together in a small bowl. Mix the vanilla and white vinegar together in a separate bowl. 2. Whip the Meringue: Make sure your mixing bowl and beaters are very clean with no residual fat or grease. Pour the egg whites in to the bowl and begin beating at low speed. Gradually increase the speed to medium. When the egg whites have reached soft peak consistency and the beaters leave trails in the whipped whites, begin adding the sugar a few tablespoons at a time, waiting a few seconds between each addition. While doing this, gradually increase the speed so that you are at maximum speed once all the sugar has been added. Continue whipping until the meringue holds stiff peaks. Stop the mixer and sprinkle the vanilla and vinegar over the meringue. Beat for another 20 seconds to fully mix. 3. Shape the Meringue: Use a spatula to scrape all the meringue onto the parchment in the center of the circle. Working from the inside out, spread the meringue to fill the circle. Smooth the sides if desired or leave it in billowy lumps. 4. Bake the Meringue: Put the meringue in the oven and immediately turn down the heat to 250°F. Make for 60-70 minutes for one large pavlova or 50-60 minutes for mini-pavlovas. The pavlovas are done when the outsides are dry to the touch, are very slightly browned, and sound hollow when tapped. It's fine if cracks form in the crust. Turn the oven off, but leave the pavlova inside with the oven door ajar. Let sit until the pavlova is completely cooled, or overnight. At this point, the pavlova can be wrapped in plastic or sealed in an airtight container and kept for several days unless your house gets very humid (in which case, eat your pavlova right away! ).